It is no secret that the cinema canon has historically skewed toward lionizing the white, male auteur. Beyond the Canon is a monthly series that seeks to question that history and broaden horizons by pairing one much-loved, highly regarded, canonized classic with a thematically or stylistically-related—and equally brilliant—work by a filmmaker traditionally excluded from that discussion. 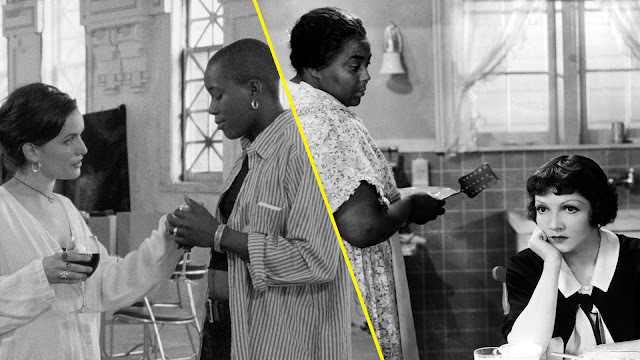 This month’s double feature pairs Cheryl Dunye’s The Watermelon Woman (1996) with John M. Stahl’s Imitation of Life (1934). John M. Stahl and Cheryl Dunye created iconic films from different vantage points, working in different eras and disparate modes. Stahl, a man of European descent, worked in the classic Hollywood studio system of the 30s, and Dunye, a queer, black, Philadelphia-raised woman, created work on the brink of the new millennium, with an ingenious practice located far from the Hollywood machine and closer to the bosom of public arts funding bodies. Released 62 years apart, Stahl’s Imitation of Life (1934) and Dunye’s The Watermelon Woman (1996) perhaps seem like strange bedfellows, but considered together they posit a nuanced, reflective view on the fraught celebrity of black actresses in early film and shifting causes célèbres in screen-based entertainment and greater society alike. 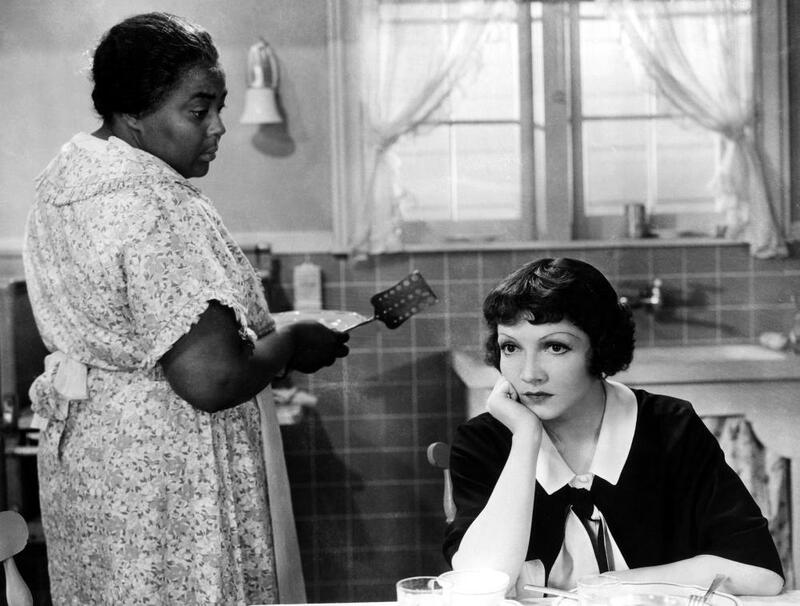 Imitation of Life brought together Claudette Colbert (of It Happened One Night fame) as Bea and scene-stealing black actress Louise Beavers as her live-in housekeeper-turned-colleague Delilah—cohabiting single mothers in a detailed, soap-operatic domestic drama. Though Colbert enjoyed first billing while Beavers was given fourth, the women’s roles were nearly equal in gravity. Delilah’s difficult relationship with her light-skinned, white-passing daughter Peola (Sebie Hendricks) provide some of the richest, most compelling narratives in the film. Imitation was a critical success, garnering three Oscar nominations and inspiring a 1959 Douglas Sirk remake that arguably precedes its prototype in renown. Dunye too made history—The Watermelon Woman came to be considered a cornerstone of the New Queer Cinema movement, a wave of films emerging in the early 90s from the likes of Derek Jarman, Isaac Julien, and Jennie Livingston, centering queer characters and narratives. Dunye’s debut feature was a playful authorship exercise with Dunye writing herself and others like her into history, particularly with the inclusion of a fictional version of herself, played by herself, as the film’s protagonist. The fictional “Cheryl” takes a burning interest in an unnamed black actress of the 30s, uncovering the history of the oft-uncredited woman who was frequently relegated to the one-dimensional “mammy” roles of the era. By contrast, Imitation’s screenplay was adapted from a 1933 novel by Fannie Hurst, the story evidently a good fit for Stahl who is remembered as a virtuoso of the melodramatic “women’s picture” genre. The mammy role Dunye references was familiar to Beavers—the dark-skinned, full-figured maid, jovial if dim-witted, a source of comic relief. Beavers scored roles in this vein in a number of Golden Age studio films alongside major white starlets of the day, such as Mae West and Jean Harlow. Dunye’s fictional muse is a staple in the black-focused “race films” of the era, and conjured in the image of early black actresses like Beavers and Gone With the Wind Oscar-winner Hattie McDaniel. Whether effectively or intentionally, both films seem to include in their mission statements a historical reinscription of possibilities for black women performers. Imitation placed Beavers in a narratively substantive role, deviating from the usual screen presence of the black woman as purely instrumental. Still, the film makes for a peculiar viewing experience in modern times, rife with feelings of dissonance—despite its progressive notes, the dynamic between Beavers and Colbert prominently features the retrograde racial stereotypes du jour and white entitlement to black labor. Notably, it’s Colbert’s character alone who realizes a romantic arc. Working more explicitly, Dunye locates sexuality and desire within the narratives of both the fictional “Cheryl” and her Old Hollywood heroine: “Cheryl’s” relationship with a white woman of relative financial and class privilege in the film mirrors that of the fictional actress, herself the muse and affection-object of a white female director as per Dunye’s crafted lore. Dunye wrote into history a sexuality for her 30s star that the mammy archetype disavowed completely, effectively mapping a queer black lineage in the screen-based entertainment industries in her signature self-reflexive, fact/fiction hybrid “Dunyementary” style. Across eras, conditions at the margins are always of interest. Stahl’s project faced scrutiny regarding its adherence to the Production Code, on account of its mere allusion to miscegenation in the existence of Delilah’s daughter of mixed-race ancestry. Decades later, Dunye articulated critiques of interracial relationships in her film, though instead as a matter of black respectability politics—she too came under institutional fire, her film one of multiple projects deemed “patently offensive and possibly pornographic” and thus unworthy of its National Endowment for the Arts funding by detractors. From the vantage point of 2018 following Beavers’ posthumous induction into the Black Filmmakers Hall of Fame, Imitation’s entry into the National Film Registry in 1995, and The Watermelon Woman’s 2016 restoration and re-release, it seems likely that it’s the willingness to test the permeability of limits that has granted these works their endurance in the cultural imaginary. Beyond the Canon: The Watermelon Woman + Imitation of Life screens Sat, May 19 at 2pm. Lydia Ogwang is a writer and editor based in Toronto. She has written for Cinema Scope, Brooklyn Rail, TIFF’s The Review, and others. Follow her on Twitter @lydiaohh. Hey Folks! Very recent I found one of the most reliable yet affordable Online Assignment Help services. I have asked the professional writers to make assignments on my behalf. And the result I received was totally up to my expectation. I never thought I would be so happy to choose an online assignment writing service. It is my advice to visit their website once to get the most customized assignment writing solutions irrespective of subjects and types. In Leeds students assignment help offers their best homework help services for the students that have problem in writing their homework. Get help on homework help Leeds and you can achieve your goal with our experts help. This can be a big example for many people and I am sure that people can learn the best things from this women. However, there must be a need by which things should be sorted out as dissertation writing services have suggested. Thanks for your excellent blog, nice work keep it up thanks for sharing the knowledge. For students help you just look at the Assignment help given by the assignment experts. Opting for Best Assignment Help could be ideal for such students and they can get a complete assignment solution. Write My Essay service online provides by Australiaassignmenthelp.com. Students always need the best writer. Don’t worry, we provide the best essay writing service online. Our experts cover all the essay topics. Book now! Some time english home work is tough academic task that is not possible for every student to finish it accurately. So the online helpers at StudentsAssignmentHelp.com is continue offering its excellent English Homework Help services and make their academic life easy. Every day we are keeps moving with you with every academic discipline that you face troubles in. The best team is always giving for students and they can easily complete all your assignment accurately and in the asked format. We provide the best homework helper in UAE So, students can easily collect top homework help services today and score high marks. Our experts always ready 24*7 hours supports for students. We are provide best service and support in antivirus field. If your antivirus not working, not responding, Avast Ui failed to load, Avast Ui failed to load windows 10 these problem occur so you contact with our Avast Tech support team. They will give you best assistance. They will help you. We know quality matters for students that is why all our work is original and free from any kind of plagiarism work. Thus save your precious time and stay tension free. StudentsAssignmentHelp.com working with team of professional experts that deliver the best C Programming Assignment Help services. 2500+ assignment experts at IrelandAssignmentHelp.com offer all its students with outstanding essay assignment suggestion. Our native Essay writers Ireland will guide you to finish your work appropriately. The quality assignment help providing by Assignment Help Firm to the students in Australia. I agree with you. Students need a lot of time to get the right grasp over things. But the problem is homework never stops, that's where teachers go wrong, loading them with the work. I think websites like Go Assignment Help, help in such cases with their AssignmentHelp Services. This is an really amazing blog post you shared with us. Thank you very much for your post. So happy to read this. It's been very informative. Have a look at my edubirdie website! You will get all sorts of essay assignments related to your academics. Thank you for sharing them! Amazing article! I hope you will continue to have similar posts to share with everyone. College and university students can avail Dissertation writing help services from most reputed dissertation help firm of ireland, IrelandAssignmentHelp.com is the renowned dissertation help company in Ireland serving from past 10 years. Assignment Firm Help is the most reputed firm in Australia in the field of the assignment writing and many more. The firm has handsome experinece in Operations Management Assignment Help service. Geek Squad Tech Support group is accessible 24/7 across the globe. These experts are trained to resolve various tech issues. Call the experts at Geek Squad Tech Support Prices for 24/7 help and avail best help on device repair. Helpful Suggestions, for glitches and tech help go through the HP Support for proficient Aid. Persuasive Writing Help service is offered by Assignment Firm Help. Behind the Scenes—Gina Dyches Superstar!